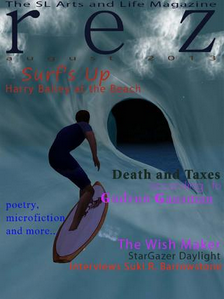 In Second Life's a Beach, The Perfect Gentleman, Harry Bailey, goes in search of the perfect SL wave - - and finds it, and in the offing, teaches us the virtues of hanging ten. SL fashion maven, Suki R. Barrowstone, gives an enlightening interview with StarGazer Daylight, and reveals her thoughts about the SL's fashion world in The Wish Maker. SL poetess extraordinaire, Luna Branwen, peers into the great SL unknown and forever changes our perspective in her poem, Peering. Gudrun Gausman gives a tutorial on making money in SL and ponders absolutes in her piece, Death and Taxes. Another favorite poet, Adrian Blair, reminds us of what we hated and loved about school, in his poem, School Days. Elysienne examines the lowly weed, in her thoughtful piece, Weeds, wherein she tells us about our neighborhoods and ourselves. If you're a Cole Porter fan, you may be interested in what Crap Mariner has to say about his extremities in Cole Porter's Leg.